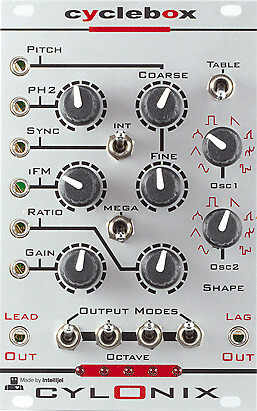 The Intellijel / Cylonix collaboration Cyclebox II is a complex digital duo VCO plus a suboscillator capable of operating a variety of modes. Multiple wavetable-based waveforms are on tap for both oscillators in addition to VC controllable wavefolding, through-zero FM of oscillator 1 by oscillator 2, and internal or external sync. Recreating the Synths of Aphex Twin's "Selected Ambient Works II"